Help ! 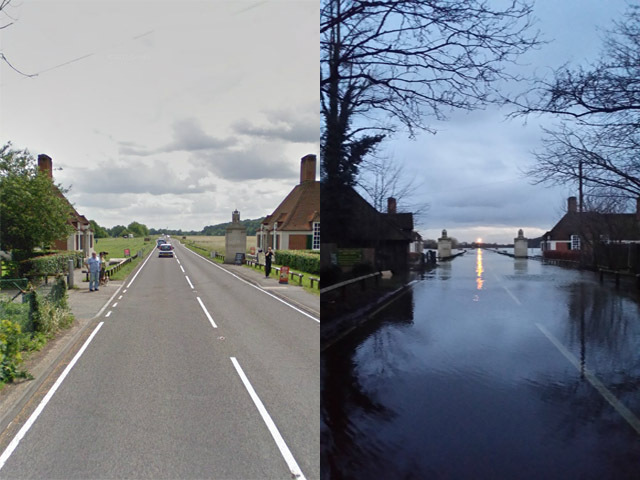 Britain is sinking. A ride out yesterday, nothing crazy just something to try and get me in the right frame of mind and getting used to sitting in the saddle again. I took a spin through the Great Park and onto Old Windsor. I didn’t get far, roads shut and traffic in chaos. 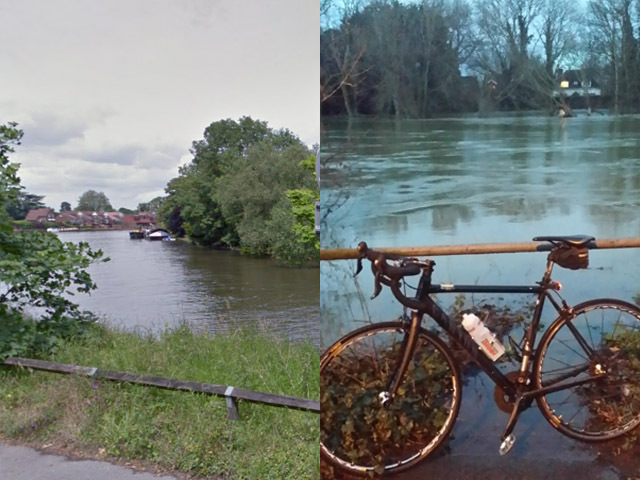 The Thames was pretty close to busting its banks at Old Windsor and the Runnymede Lodges were a few feet under. I took a few photos and retraced my route for a coffee at my using cyclists cafe. Follow on twitter @greypea for more Polypeloton moments. 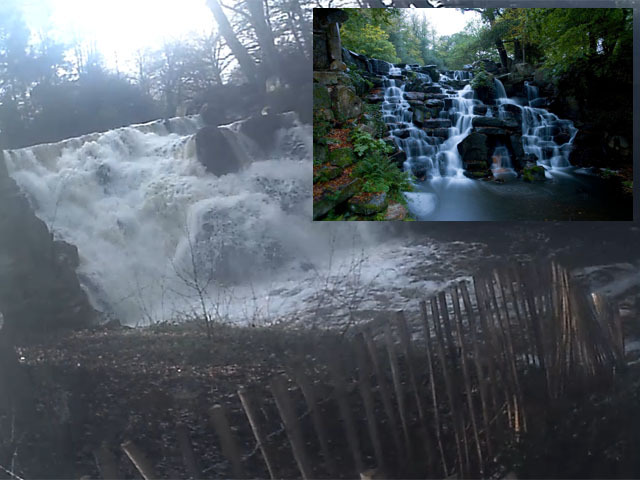 Virginia Water – Last summer / Now. Saturday afternoon was a quick spin before the rugby. No ride with Woking CC this Sunday it was just too windy for my liking, and I will get back into the longer runs when the weather eventually sorts its life out. Well, the ballot results for the Prudential Ridelondon are out and some 80000 Bradley Wiggins / Chris Froome / Mark Cavendish wannabees are all waiting every morning on their doorsteps for the postman. I spent the last few days being very “Matter of fact” about if I was going to get a place and how “it would be really nice to repeat the experience – if I got a place” but I was “not too worried” if I didn’t etc etc, (but secretly hanging about in the bushes waiting to ambush the postman every morning was not going down well with the neighbours) So today was the day that ended the waiting – and this arrived through my letterbox. 2: Clock up some miles on the bike. 3: ….. and then do even more miles on the bike. 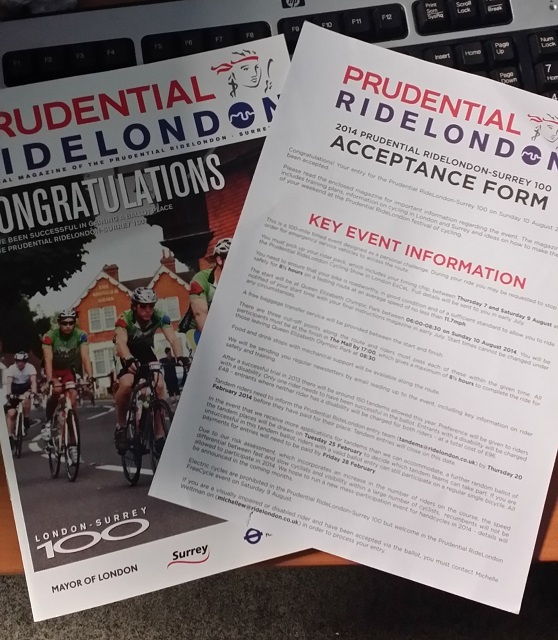 If you are riding for the first time in the Prudential Ride London 100 – Check out my older posts from last years event.